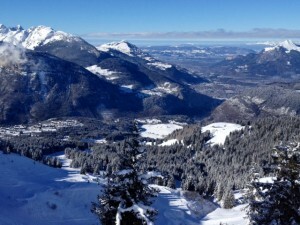 The village of Les Carroz at 1200m is part of the Grand Massif ski area, one of the largest linked ski domain in France. It started life as a typical mountain farming community and is a hidden gem! Although well known to the French as it is one of the oldest French ski villages having celebrated its 80th Anniversary in 2016! Situated on a sunny plateau above the Arve valley and is just 15 minutes from the A40 motorway connecting Geneva and Chamonix. Les Carroz is only 50 minutes from the airport at Geneva. If you were to drive to us from the UK, we are only 8 hours or 540 miles from Calais. The village retains its rustic charm and authenticity and has a number of shops and restaurants for all tastes.